Detection and quantitation of protein–ligand binding interactions is important in many areas of biological research. Stability of proteins from rates of oxidation (SPROX) is an energetics-based technique for identifying the proteins targets of ligands in complex biological mixtures. Knowing the false-positive rate of protein target discovery in proteome-wide SPROX experiments is important for the correct interpretation of results. Reported here are the results of a control SPROX experiment in which chemical denaturation data is obtained on the proteins in two samples that originated from the same yeast lysate, as would be done in a typical SPROX experiment except that one sample would be spiked with the test ligand. False-positive rates of 1.2-2.2 % and <0.8 % are calculated for SPROX experiments using Q-TOF and Orbitrap mass spectrometer systems, respectively. 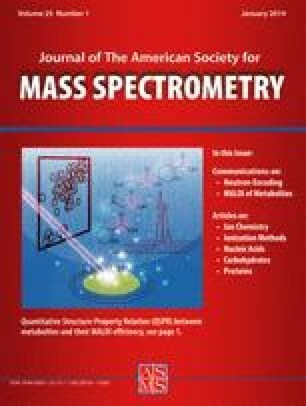 Our results indicate that the false-positive rate is largely determined by random errors associated with the mass spectral analysis of the isobaric mass tag (e.g., iTRAQ®) reporter ions used for peptide quantitation. Our results also suggest that technical replicates can be used to effectively eliminate such false positives that result from this random error, as is demonstrated in a SPROX experiment to identify yeast protein targets of the drug, manassantin A. The impact of ion purity in the tandem mass spectral analyses and of background oxidation on the false-positive rate of protein target discovery using SPROX is also discussed. The online version of this article (doi: 10.1007/s13361-013-0754-2) contains supplementary material, which is available to authorized users. The authors acknowledge support for this work by a grant from the National Institutes of Health (GM084174) to M.C.F. and by a Research Scholar Grant (122057-RSG-12-045-01-CDD) from the American Cancer Society to J.H. The authors also thank Lisa Jones and the Proteomics Facility at the Fred Hutchinson Cancer Center for the collection of Orbitrap data.